Gilt bronze monster mask found in Hwangyongsa in Gyeongju. September. 06, 2018 08:06. by Won-Mo Yu onemore@donga.com. A gilt bronze monster mask during the United Shilla Dynasty made with openwork (scraping out part of the metal plate) has been excavated at the Hwangyongsa site in Gyeongju City, North Gyeongsang Province. 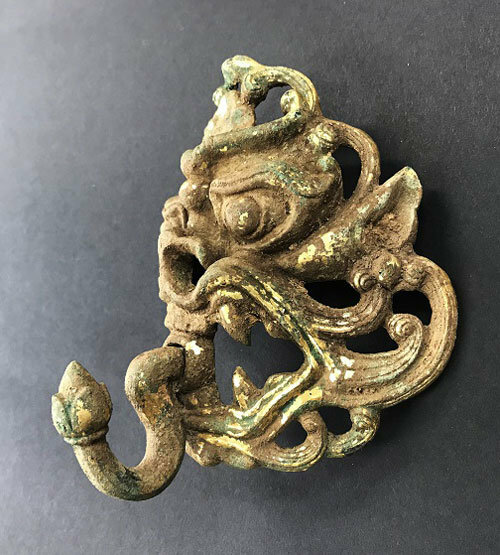 The Buddhist Culture Research Center announced Tuesday that it found a gilt bronze monster mask for the first time in Korea during the process of prospecting the Hwangyongsa site in July. The gilt bronze monster mask that was identified is 15 centimeters high, which is the size of an adult’s hand. A ring is connected to the mouth, appearing three-dimensional. The monster mask, which is an avatar that keeps a watch on evil groups, is an ornament that often displays just the face rather than the whole body.